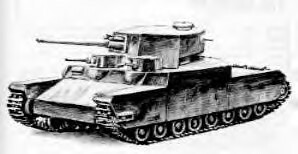 The Japanese O-I experimental super heavy tank had three turrets and weighed 120 tons, more than any of the German Tiger tanks, but less than the 188 ton Maus or rival 140 ton E-100. It was 10 meters long by 4.2 meters wide with an overall height of 4 meters. The armor was 200 mm (8 inches) at its maximum. The tank had a top speed of 25 km/h (15 mph) and was crewed by eleven men! This first version had two 12 cylinder gasoline engines each developing 550 PS @ 1500 rpm. For armament, the O-I had a massive105 mm main gun believed to be a redesigned Type 92 artillery gun which weighed five tons, forcing a redesign of the O-I main turret for accommodation . The tank also had a Type 1 37 mm in a forward mounted sub turret and three Type 97 7.7 mm machine guns (one mounted in a forward sub turret) whereas another experimental version also mounted a Type 1 37 mm in a rear facing sub turret. The O-I would carry 60 rounds for the 105mm gun, 100 rounds for the 37mm gun, and a total of 7,470 rounds for the three machine guns! It has been reported that a single copy of the O-I was manufactured before the end of the war and was shipped to <?xml:namespace prefix = st1 ns = "urn:schemas-microsoft-com:office:smarttags" />Manchuria, according to an engineer concerned with the project. Generally unknown, the O-I is a mystery like the Krupp Kugelpanzer similarly shipped to Manchuria in 1945. No photos of the O-I have been discovered; only some drawings are known to exist. All images of the tanks are strictly provisional. 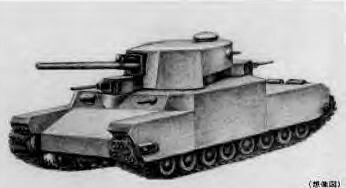 The O-I Experimental Ultra Heavy Tank was a modification of the standard O-I Super Heavy Tank and had 4 turrets but is not believed to have been completed by V-J Day.